Each week I push into our early childhood classrooms (age 3 to 5) to do a read aloud, book talk, and related project or activity. This year I decided to incorporate yoga and movement into my sessions with these little ones, so you’ll often see my lesson plans and the outcomes (what worked, what didn’t, how things can be modified). You’ll also see the motor and language/literacy targets for each lesson. These lessons could be used or modified for slightly older grades, such as Kinder and 1st grade. I’ve limited the number of poses for most of these lesson plans to about 4-6, but I have added additional ideas to some if you want to expand. The first session of the year was an easy introduction since we have a number of new kids in our early childhood 2 (EC2) classrooms and all new students in our early childhood 1 (EC1) classrooms. 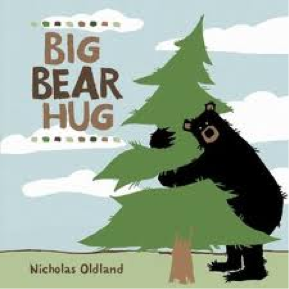 I chose the book Big Bear Hug by Nicholas Oldland because its a fun, heartwarming story, targets great values for this age (or any age really), and lends itself to a few wonderful poses. The kids were really enthusiastic about the yoga poses and got very silly during bear pose before the read aloud. They were falling all over each other, giggling, tickling each other, and “growling.” It was awesome. But after the read aloud, when I asked them to “walk like a bear” to their tables for the art activity, they had a little trouble and fell back into complete silliness. Getting them back on track was a little tricky, so next time I will model the walking first. I will also have them go to the tables two by two. I may also try introducing a freeze game where they all freeze in a pose when I say “FREEZE!” This may help some with the classroom management end. All in all, it was a successful first lesson with yoga, and I’m excited to try (and share) more! UPDATE: In another class, one student suggested lining up to do Bear pose to walk to their tables. It worked like a charm! They formed a train to the edge of the carpet, and then got up and walked the rest of the way to their tables.